Congratulations to Pacific Northwest National Laboratory scientists Dr. Susan Crowell and Dr. Justin Teeguarden for their contributions to two published papers named "Best Papers Published in 2013 Demonstrating Application of Risk Assessment" by the Risk Assessment Specialty Section (RASS) of the Society of Toxicology (SOT). 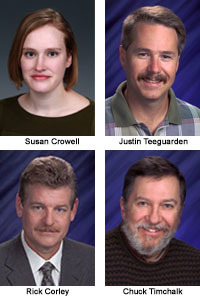 Crowell and Teeguarden were the primary authors of their respective papers. "Impact of Pregnancy on the Pharmacokinetics of Dibenzo[def,p]chrysene in Mice" was authored by Crowell along with senior author Dr. Rick Corley, Jolen Soelberg, Natalie Sadler, and Dr. Aaron Wright (all from PNNL); as well as colleagues at Penn State University and Oregon State University. The paper appeared in Toxicological Sciences. "A Multi-route Model of Nicotine-cotinine Pharmacokinetics and Brain Nicotinic Acetylcholine Receptor Binding in Humans," which appeared in Regulatory Toxicology and Pharmacology, was authored by Teeguarden with senior author Dr. Chuck Timchalk, Dr. Jordan Smith, and colleagues from AEGIS Technologies and Pharsight Corporation. All of the authors will be recognized at a reception during the SOT Annual Meeting March 24-27, 2014 in Phoenix, Arizona. The RASS is the largest specialty section of the SOT, the major scientific society focusing on the acquisition and utilization of knowledge in toxicology to aid in protection of human health. Crowell SR, A Sharma, S Amin, JJ Soelberg, NC Sadler, AT Wright, WM Baird, DE Williams, and RA Corley. 2013. "Impact of Pregnancy on the Pharmacokinetics of Dibenzo[def,p]chrysene in Mice." Toxicological Sciences 135(1):48-62. DOI: 10.1093/toxsci/kft124. Teeguarden JG, CJ Housand, JN Smith, PM Hinderliter, R Gunawan, and CA Timchalk. 2013. "A Multi-route Model of Nicotine-cotinine Pharmacokinetics, Pharmacodynamics and Brain Nicotinic Acetylcholine Receptor Binding in Humans." Regulatory Toxicology and Pharmacology 65(1):12-28. DOI: 10.1016/j.yrtph.2012.10.007.